About 35 species, of western North America and Mexico. Type species: C. elegans Pursh. Anthers obtuse; gland of inner perianth-segments orbicular or oval. Anthers acute; gland transverse, cursed or reniform. Fritillaria alba Nutt. Gen. 1: 222. 1818? 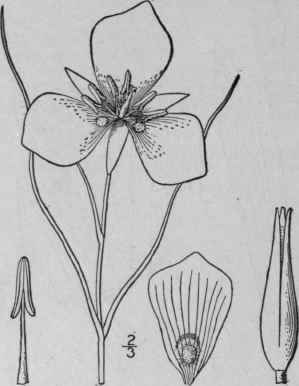 Calochortus Nuttallii T. & G. Pac. R. R. Rep. 2: 124. 1855. Corm ovoid-oblong, 6"-10" high. Stem slender, few-leaved, branched or sometimes simple, 3'-I5' tall; leaves 1-3' long, 1"-21/2" wide, the lowest commonly bearing a bulb in its axil; peduncles 2'-6' long; outer perianth-segments lanceolate or ovate-lanceolate, green with lighter margins, acute or acuminate, shorter than the inner, sometimes with a dark or hairy spot within; inner perianth-segments broadly obovate-cuneate, 1'-1 1/2' long, 10"-12" wide, white, lilac or yellowish, with a yellow base and a purple or purplish spot, the gland orbicular or oval and more or less pubescent; filaments 3"-4" long, about equalling the oblong obtuse sagittate anthers; capsule about 1 1/2' long, 3"-4" thick, acuminate, the valves obliquely cross-lined. South Dakota to Nebraska and California. June-July. 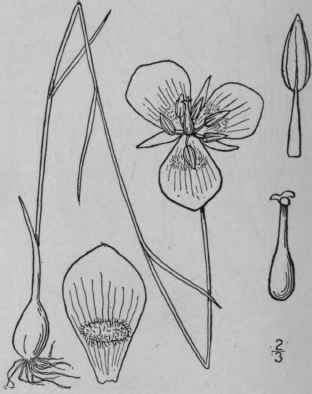 Calochortus Gunnisoni S. Wats. Bot. King's Exp. 348. 1871. Stem slender, often simple, 6-15' high. Leaves usually less than 1" wide, involute, at least when dry, none of the axils bulb-bearing in any specimen seen; peduncles 1'-4' long; outer perianth-segments lanceolate or oblong-lanceolate, scarious-margined, acuminate; inner perianth-segments similar to those of the preceding species, lilac, yellowish below the middle, purple-lined and banded, the gland transverse, oblong, curved or reni-form, pubescent; anthers acute; capsule narrowly oblong, narrowed at both ends, about 1 1/4' long. South Dakota and Nebraska to Arizona and New Mexico. June-July.